A lightweight pair of augmented reality glasses that overlay the world with digital content, such as directions or a travel guide, has debuted in Japan. 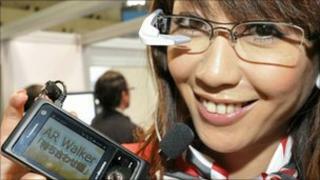 The headset, created by Olympus and phone-maker NTT Docomo, uses augmented reality software on an attached phone. A virtual tour of Kyoto was used as the first demonstration of the technology. While AR glasses are nothing new, these are among the first to add a miniature projecting display without too causing much encumbrance to the wearer. Researchers at the two companies said they had managed to whittle an earlier "AV Walker" prototype down from 91g to no more than 20g. One arm of the spectacles frame holds a tiny retinal display. The retinal display projects text and images directly into the user's peripheral vision, allowing the wearer to maintain eye contact with whatever they are observing normally. As the glasses are attached to a smartphone with AR software, an acceleration sensor and a direction sensor, the AR Walker knows approximately what you are looking at and provides augmented information relevant to where you may be. In the mock-up shown off at Japan's annual tech show Ceatec, a virtual Kyoto cityscape was created where a character, not unlike Window's animated paperclip, pops up to guide a person around the city; introducing temples, restaurants and shops as a tourist moves around. The display can also be used to give directions with arrows and if a person lifts their head up to the sky a weather forecast is automatically protected into their peripheral vision. Tokyo-based technology analyst Steven Nagata praised the "cool" and light good looks of AV Walker but said he felt the technology needed refinement. "The promise of a walking, heads up display that would be able to provide important and relevant information about your environment with minimal interaction is the holy grail of mobile technology," he said. "And while the Docomo demo was more circus side-show than cutting edge technology, it may help inspire real innovation in the future." Augmented reality apps for smartphones such as Laya and Wikitude are already having some success as guides to our immediate surroundings. But as this usually involves holding up and pointing the mobile's camera in the direction you are looking AV Walker and its like have the added benefit of accessing information about your surroundings without altering your natural behaviour. According to the developers a release date for the AR glasses has yet to be determined.